Chedgrave is a small parish in south Norfolk, several miles southeast of Norwich. The south boundary of the parish is formed by the old course of the River Chet (named after the village) and this old boundary separated Chedgrave village from Loddon. The name of the village is Old English is translated as pit or grove of a man called Ceatta. The village is recorded in the Domesday Book where it is recorded that Thored and Leofric held some of the land, including woodland, two mills and 200 sheep, before 1066. The modern settlement has grown since the 19th century and is concentrated at Chedgrave. Langley House is located to the northwest of the parish. The prehistoric archaeology is scattered through the parish. The earliest find is a Palaeolithic axehead (NHER 10362) from the grounds of Langley Hall. A Neolithic axehead (NHER 32000) and a possible Neolithic cremation (NHER 1038) and pieces of Neolithic pottery were excavated during development of the Loddon bypass. A later Bronze Age pot (NHER 10526) and a complete Beaker period pot (NHER 10525) were found and broken during the building of the sewers for Hillside in the 1960s. A prehistoric flint knife (NHER 19007) has also been recovered. This is evidence for prehistoric activity in the area but it is difficult to characterise this activity. Although no prehistoric sites have been identified there is clear evidence for Roman activity in the parish from aerial photographs. To the east of the parish a playing card shaped cropmark can be seen. This is probably a Roman temporary or marching camp (NHER 36358). Other cropmarks at the same site may also be later Roman enclosures and field boundaries (NHER 36358). A Roman brooch (NHER 24003) has been found here. At a second site further possible Roman field systems (NHER 18331) can be seen and several Roman coins (NHER 18331) have been found. The only remains recorded from the Saxon period were excavated at All Saints’ Church (NHER 10526). Here the foundations of a Saxon round tower and several Late Saxon skeletons were uncovered during excavations. This corroborates the Domesday Book that recorded the village as having a church. The lack of Saxon archaeology does not necessarily relate to lack of activity as several landowners and two mills are recorded in the survey. There is more evidence for activity in the medieval period when the church was rebuilt in the 12th century. 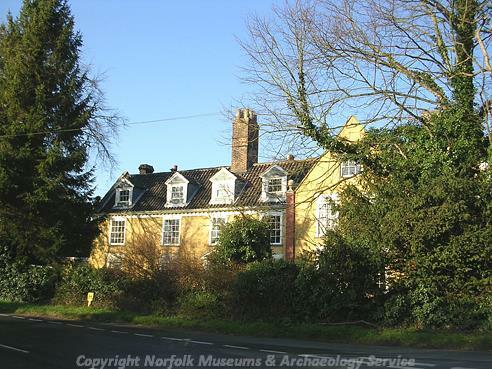 The Old Rectory is a medieval hall house (NHER 13865) with later additions and it is said that Norfolk’s richest weaver lived here at one time. It seems that sheep and wool were still a source of wealth for the parish. During the medieval period Langley Park was a deer park (NHER 30467). In addition to these monuments metal detecting has recovered a medieval lamp hanger (NHER 18331) and a medieval doorframe, quern and millstone (NHER 18403) were found in a garden. Langley Hall (NHER 10362) was built in 1740 incorporating an earlier house and Langley Park (NHER 30467) was first laid out in 1736. 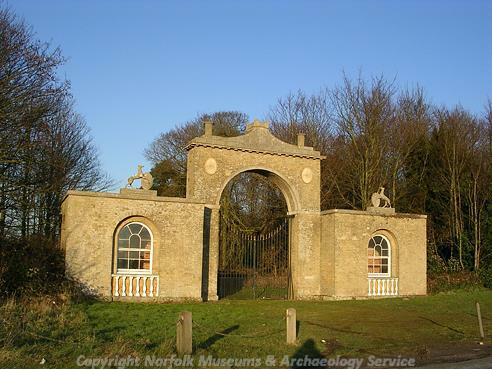 The grand entranceway, Chedgrave Gate (NHER 13864), is guarded by two symmetrical brick lodges built in 1784 decorated with engraved heraldic shields with the motto TOUJOURS FIDELE (always faithful). These are linked by a brick arch and a pair of curved iron gates. Several other post medieval buildings (NHER 13468 and 18403) also survive in the village itself. Continuing the woollen theme a post medieval cloth seal (NHER 18331) with the coat of arms was found in the parish by a metal detectorist. A coin of William III (NHER 37550) has also been found in a garden in Chedgrave. The parish has been in constant occupation since the prehistoric period and although the archaeological record is not large it represents clear evidence for activity from the Palaeolithic onwards. http://www.roll-of-honour.com/Norfolk/Chedgrave.html. Accessed 14 February 2006.
http://www.norfolkchurches.co.uk/chedgrave/chedgrave.htm. Accessed 14 February 2006.